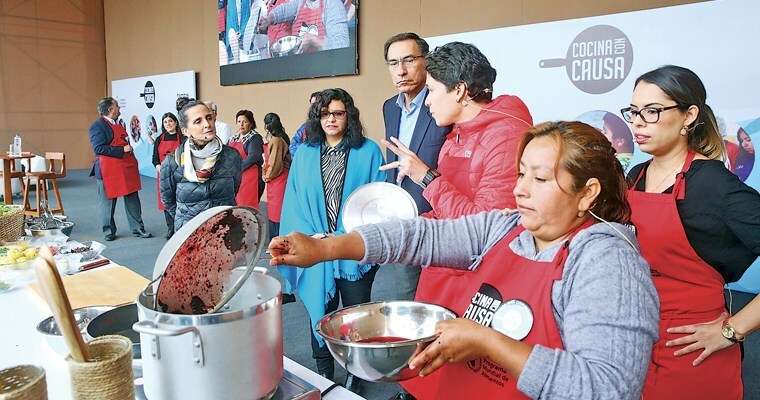 The Government of Peru is planning to dramatically reduce levels of child anaemia and malnutrition, one of its primary targets in the social sphere, using a multi-sectoral strategy involving the mobilization of social programme promoters and community agents. ““Combating anaemia is the priority for the Government and we want it to be the priority for Peru. We need to lower it from 43 per cent to the goal we have set ourselves of 19 per cent within three years. In so doing we really will be fulfilling the role of the State of working for the future, prioritizing children””, said Peruvian president Martín Vizcarra. The President was optimistic about working wholeheartedly, together with his Cabinet and local and regional authorities, hand in hand with the public to tackle the anaemia that endangers the healthy growth of children in every region of the country. Combating childhood anaemia and malnutrition is an objective of the Government. Tomorrow, I will be taking part in the #CocinaConCausa programme, an initiative to promote the consumption of nutrient-rich foods. He recalled that a few days previously he had been in Ayacucho region, where he had the opportunity to find out about the experience of Iguaín district. There, they successfully reduced childhood anaemia from 65 per cent to 25 per cent in two years. President Vizcarra insisted that the role of mothers was essential to this work as its principal allies, as they are the ones who feed their children from their time in the womb. The Minister of Development and Social Inclusion, Liliana La Rosa, highlighted the support of the WFP to tackle anaemia. It is a privilege for me to be part of the Government and a great joy that, together with the World Food Programme, the United Nations and the entire Executive, we are fighting anaemia.